In a world of growing capital mobility and financial innovation, countries find it increasingly difficult properly to reach capital income under their global income taxes. As a result, capital income is taxed lightly or not at all. This violates commonly accepted equity and neutrality criteria. In trying to remedy the situation, the Scandinavian countries and Finland have introduced a dual income tax under which the tax treatment of capital income is separated from the tax treatment of labor income. While labor income continues to be taxed at high progressive rates, capital income is subject to a low, uniform rate of tax. Austria has also taken steps towards a dual income tax, by introducing (among other measures) a final, flat source-withholding tax on interest. To examine these developments, the Foundation for European Fiscal Studies of Erasmus University Rotterdam organized a seminar in May 1995 to discuss the papers on various aspects of the dual income tax presented by Leif Mutén (Stockholm School of Economics), Kåre P. Hagen (Norwegian School of Economics and Business Administration), Peter B. Sorensen (Economic Policy Research Unit, Copenhagen) and Bernd Genser (University of Konstanz). While the dual income tax has resulted in the more effective taxation of capital income, it has also led to problems in dealing adequately with the separation of capital and labor income accruing in proprietorships and closed companies. Nonetheless, the dual income tax seems to provide more equal treatment and neutrality than the so-called global income tax. 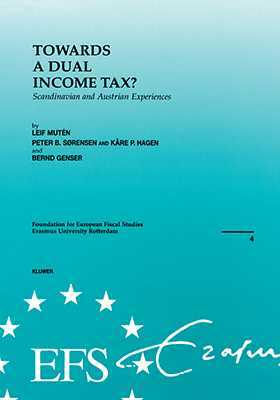 This brochure is the fourth in a new series initiated by the Foundation for European Fiscal Studies.